Don’t miss the Denali Highway—featured as the #2 “Drive of a Lifetime” by National Geographic Traveler magazine! Once the gateway to Denali National Park, this 135-mile gravel road is surrounded by pristine nature and is a photographer’s paradise. Snow-capped mountains, icy glaciers and panoramic vistas flank the Denali Highway. During your guided and narrated 100+ mile round trip excursion, there are opportunities to see Denali (formerly Mt. McKinley) and wildlife (both weather permitting). New, four-door, 4×4 Jeeps hug the dirt road, while comfortably seating four adults who can trade off driving. Each Jeep has a CB radio for communicating with the guide so stops can be made whenever desired. 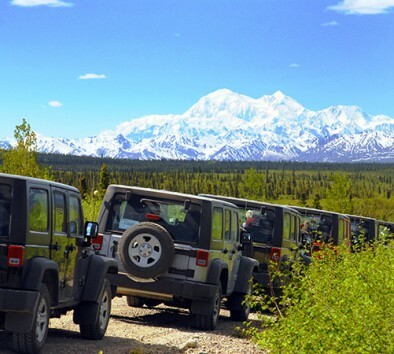 As driving the Denali Highway is prohibited by most rental vehicle companies, this exclusive excursion provides access to more of Alaska’s spectacular scenery and wildlife and is a great alternative to crowded bus trips. Wear comfortable walking shoes. Dress in warm layers. Bring a jacket, camera and binoculars. Minimum age to drive is 25 years. A waiver must be signed. Bring your driver’s license. Car seats and booster seats are available upon request. Wildlife sightings are likely but not guaranteed. Jeep Wranglers® carry up to four passengers per vehicle. There will be ample time to switch drivers so that everyone interested in driving will have the opportunity. Time in jeep is approximately 4 hours.